This is only the second Ponton I've ever got to see since I visited Mercedes-Benz's excellent museum at its home in Stuttgart, Germany. And the first presentable one - the previous one was a mere shell. The Ponton ("pontoon") was a line of simple, rugged, reliable sedans for postwar West Germany and beyond, and helped rebuild Mercedes-Benz. 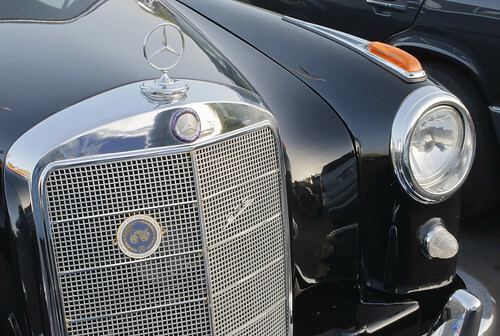 The Ponton, the first unibody design from Mercedes-Benz, is the ancestor of all current Mercedes-Benz sedans, including the C, E, and S classes. Grille detail, complete with Mercedes-Benz Stuttgart plaque.